Keystone Answering Service is committed to providing high quality and cost-effective service to you and your callers. We helped design and beta test all four levels of certifications within the telephone answering service industry: Agent, Advanced Agent, Supervisor, and Site Certifications. In fact, we hold ATSI Site Certification # 001. We are literally the first in our industry. We adhere to industry best practices and run a continuous call monitoring program to ensure that each of our Call Center staff members provide excellent service. Our dedication to excellence has been recognized by the telephone answering service industry many times. Every employee at Keystone knows that to our valued clients, “we are only as good as our last call.” Read more about our awards and achievements. In fact we have received the ATSI Award of Excellence every year since 1998, and the CAM-X Award of Excellence consecutively since 2008. In addition, we have achieved the TOP SCORE twice, the TOP CALL AWARD twice, and placed in the TOP TEN of all participating answering services ten times! Our track record speaks for itself. Please see our latest Press Release which summarizes Keystone’s performance in both industry programs. The ATSI Agent Certification Program is designed to recognize telephone answering service agents who have achieved a level of proficiency. This accreditation ensures that agents have the proper skill set required to provide outstanding customer service to your clients. All of Keystone’s agents, with a tenure over six months, are qualified to become Agent Certified. At Keystone, Agent Certification is the first step to further advancement within our organization. The ATSI Advanced Agent (formerly Dispatcher) Certification Program expands upon the requirements of the ATSI Agent Certification program, requiring agents to demonstrate proper call handling and dispatching skills, as well as sound decision making capabilities. Employees need a minium of one year of experience to qualify for Advance Agent Certification. 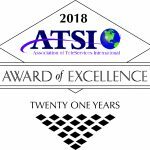 All Keystone Answering Service Dispatchers are ATSI Agent Certified. This is the second step of advancement within Keystone Answering Service, and as is the case with Agent Certification, employees receive a recognition award, a bonus, and a raise in recognition of their increased skill set. We selected Startel as our Disaster Recovery & Business Continuity provider. The Startel DR Solution provides us with a complete failover solution, enabling the company to quickly and safely backup application data in a simple, non-disruptive manner. Key features of the Startel DR Solution include failover provisioning of trunks, automated synchronization of database and key file backup; and a backup system that acts as a hot standby system. With the Startel DR solution, web and data synchronizations occur automatically.